*Ahem* Well, now that I'm all hot under the collar I'd best abandon that train of thought, right? But oh those figs. Heavy with the promise of their indulgently sweet insides. Mmmm I just can't get enough of it. Whomever first hinted that figs were the food of romance sure knew what he/she was talking about. I had to procure my own little bit of heaven. And so I went back to the store. Grabbed the top tray. Inspected the perfect specimens inside. Sighed with enjoyment. Rushed to the till. Then rushed home. Oh yes, TheHusband was also part of this whole exercise, but he seemed somewhat less enamoured with the whole deal. No, I don't know what is wrong with him that he remains unaffected by the lure of the fig. Anyhow, when I got home I immediately took my knife to these beauties. Split them in half. Again. Drenched them with the goodness of balsamic vinegar - it accentuates their sweetness - and olive oil - because... ah... well you can't go wrong with olive oil. The aromas escaping from that oven could've made me a lot of money had I the wits about me to somehow bottle it. And sell it to gullible people much like myself. Alas, I did not do that. Instead I mixed them into pasta with a few leaves of spinach and a good amount of crumbled feta. And then we sat down, just the two of us, and enjoyed every last mouthful. Now whoever said that Thursdays were pedestrian? 1. Cook spaghetti in a pot of salted boiling water until al dente. 2. Meanwhile, drizzle two tablespoons of olive oil and a splash of balsamic vinegar over the fig quarters. Place in oven at 180C for 10 - 15 minutes. 3. Heat the remainder of the oil in a large frying pan, add the garlic and fry for a few seconds. 4. Add spinach to the pan and cook for a few minutes or until wilted (you might need to add a splash of water to ensure the spinach doesn't burn). 5. 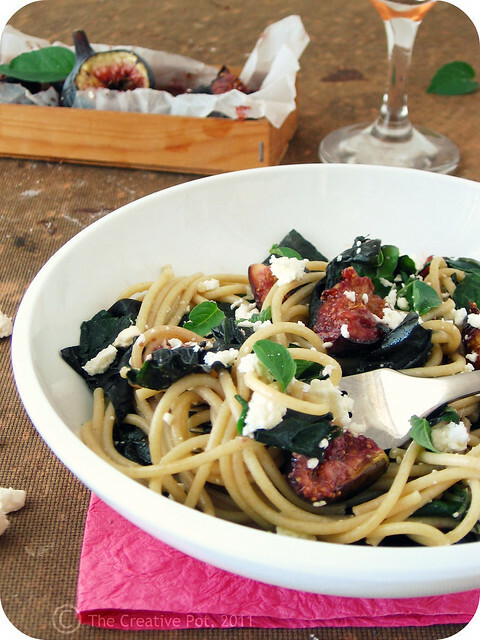 When pasta is cooked, drain and toss with spinach, feta and figs. Add salt and pepper to taste and optionally another splash of balsamic. I prefer it with the added splash, TheHusband likes it plain. Variation: Leave spinach out and replace with ribbons of zucchini (made with a vegetable peeler). Lovely comfort meal, looks great. I think I get increasingly jealous of your warm weather and gorgeous produce with every recipe. Oh figs. How I miss thee. This is such a gorgeous dish. Oooh, this would be great with goat cheese, too! What an amazing combination of flavors. This could not look more delicious. 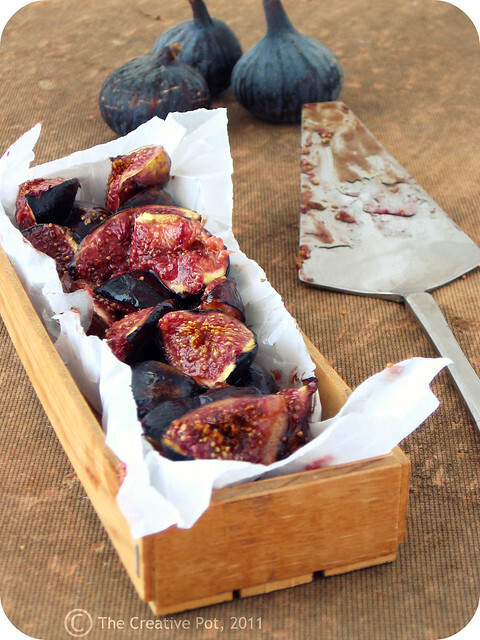 Figs, glorious figs - I could eat figs every day of the week! I love the originality of your dish. I've tried figs with pizza but never with pasta - this looks glorious. Never thought of figs going with pasta. Interesting idea. Love the second figgy photo! What a fantastic combination of ingredients, the salty feta and the sweet figs must have been just perfect together. I envy that you have figs available at the market now. I guess I will have to wait until summer to try this, but I have a feeling it will be worth the wait! I adore figs. Unfortunately we are miles away from the days you can receive good figs in my hometown. At the moment it is freezy and I wonder how long a winter can last.. But nonetheless I enjoyed very much your recipe and the fotos.. It is like a hello from summer and sun... So I think I´ll try some dayx your recipe when summer has also reached my country..
O my goodness, Marissa... I don't know how I found this post, but the spaghetti with feta and figs are such a wonderful idea!! YUmmy!